Raise your beer stein because it’s Oktoberfest in Tampa! This Bavarian tradition will be celebrated this month throughout Tampa’s restaurant, bars, and events hosted downtown, North Tampa and Ybor. Grab friends and prepare for days of German food and beer by celebrating Oktoberfest here in Tampa. Prost! Cheers! Mr Dunderbak's Dunderfest is happening every weekend from Thursday through Sundays in October! Come to Tampa’s favorite Biergarten and enjoy twists on Bavarian food, win prizes, and live music! On Saturday Nights, “Maaskrugstemmen” or the stein hoisting contest is being held. Men and women test their strength by holding a full one-liter beer in front of them, the last person to hoist the beer in front of them is the winner! Tampa Bay Downs is hosting their version of Oktoberfest October 20-22. This family-friendly event features live German music, dance troupes, German food, plenty of big tent Munich beers and dozens of food and arts and crafts vendors. The Arnold Family Carnival returns so there will be plenty of rides for kids of all ages! From Friday, October 13th through Sunday, October 15th, 2017, the Oktoberfest Tampa 2017 is happening downtown at Curtis Hixon Park. The official ceremonial Keg Tapping with Mayor Bob Buckhorn is on Saturday, October 14th at 3 PM, but come celebrate all weekend with great company, food, and—of course—beer! 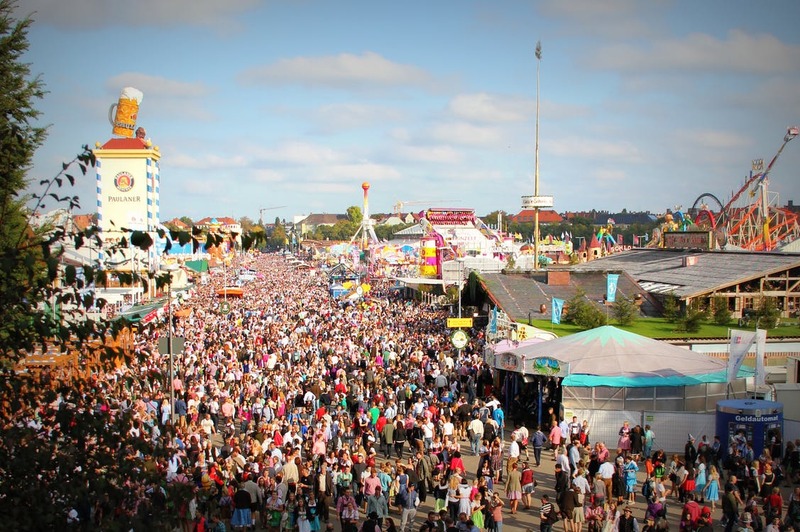 When purchasing tickets to this Oktoberfest event, be sure to check out their “Survival Guide,” and read the tips on how to navigate this German celebration in Tampa! Although Cigar City Brewing is not throwing a large celebration with every type of German beer available on draft and grilled brats, Oktoberfest is being celebrated at this Tampa local brewery by the seasonal release of their Oktoberfest Märzen! Come to their Cigar City Brewing Tasting Room during their standard business hours starting at 11 AM this month to experience this sweet and malty lager honoring this German festivity! The Ninth Annual TapToberfest!! is coming back to The Brass Tap - Wesley Chapel on October 21st, 2017. This Oktoberfest-style street party has live music, German beer, and drink specials. Come play some games in lederhosen and party all night, Bavarian style! On Friday, October 6th, Oktoberfest Bayerische Woche is happening at Taste of Berlin German Restaurant in Brandon from 4:30 PM through 8:30 PM! Enjoy the feel of Oktoberfest with live music and other entertainment when eating authentic German food! The Ybor Oktoberfest Pub Crawl 2017 on Saturday, October 21st is being held in Ybor City! Ticket admission includes access to food and drink specials at the 10 participating bars, a free das boot with lanyard, and 4 oz pour of Oktoberfest beer at each location! Expect costume contests, stein hoisting contests, pretzels, and tons of brats during this fun Oktoberfest celebration in Tampa. On Saturday, October 21st, from 2 PM through 9 PM, Six Ten Brewing is celebrating Oktoberfest in their family-friendly festival, Oktoberfest 2017! Admission is free to access their live German music and contests, cash is preferred to purchase German food and beer—don’t forget ID! In this family-friendly event, dogs are welcome and proceeds benefit Greyhound Rescue and Adoptions of Tampa Bay. WOBtoberfest is happening around Tampa on October 7th, 13th, and 21st at World of Beer locations! In World of Beer - Fowler, WOBtoberfest is happening on Saturday, October 7th, offering German drafts and Coppertail Brewing’s NEW Oktoberfest beer. In World of Beer SoHo, come on Friday, October 13th to celebrate WOBtoberfest with German beer and Oktoberfest themed giveaway raffles starting at 6 PM! On Saturday, October 21st, World of Beer Avion Park I-Plaza near International will be celebrating WOBtoberfest with music provided by 97X and Chris Nathan band. Depending on location, there will be raffles, stein hoisting competitions, and pretzel eating contests to celebrate! Enjoy Oktoberfest in Tampa! Grab friends and prepare for days of German food and beer by celebrating this Bavarian tradition. Prost! Stay connected on Things to Do, Halloween in Tampa, and Dining by registering to 813area.com - it's free!